If you've been following this so far, you took the quiz, read the explanations and now you're wondering what's the point of all this? The previous post had two more pictures with questions at the bottom. 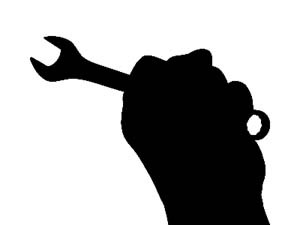 But let me ask you this, if the image shows no fingers at all, but a row of bumps and what looks like a wrench, how do you get four fingers? You just know, right? Our brain fills in the gaps of missing information. It looks like a hand, we recognise it as a hand and we assign it everything we know that goes with "hand." That means four fingers, a thumb, etc. This one is even better. All you have is a shape (stylized at best) to go from. No color, no icons... but you still come up with a horse. 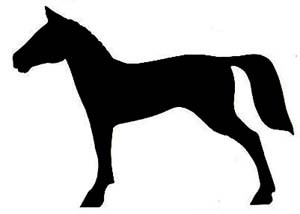 How many horses do you know of that only have two legs, no eyes, and one ear? That's all that the "horse" we "see" in the image. But we still get horse as our answer. The human brain tries to figure out what something is based on what it knows and recognizes. You don't have to show us the whole thing for our brains to figure it out. We are able to fill in the blanks and come to a fairly accurate guess. It's how you got Genestealer and Ultramarine dreadnought as answers in the quiz. Same thing goes for 40k. We know the history and background of the game and we are able to figure out what things are based on their shape, color and identifying marks. Our brain does the rest. Now... depending on how much of the background you know will determine how good you are at determining what some of the more obscure things are. But, we all know the basic background of the game, even if we don't play every single army ourselves. But how does this relate to painting? Simple. Because we know that people brains try to "fill in the blanks," we can apply this to our painting and give people information that their brain can use to make the leap to exactly what we want them to. My Deathwing troops are the perfect example. Let's look at why they work as it relates to the painting aspect. I get the bonus for the correct shape, but it's the painting that tells you exactly what Chapter they are. In reality, there is no white or even bone color on these guys. In fact, they are just primed with light grey and washed with Devlan Mud. But here's the key, they are light in overall appearance and I've added a single tan highlight on the edges of their armour. This combination (the light overall look and the tan hightlight) is all it takes for viewers to look at them and immediately make the jump to "Deathwing..." based on what most people know about the 40k universe. Add in the single shoulder pad icon (that isn't even exact, but a close approximation) and it's all a viewer needs to be sure. And what does this get me? Good question. It gets me all the associated baggage that comes with "Deathwing." Because people recognize my army, they immediately think about everything they know about Deathwing and put that on my army. When they (their brains) make the jump because they recognise the army, they immediately "fill in the gaps" with everything else they know about them. Space Wolves are another good example. What does it take to say "Space Wolves" to a viewer? 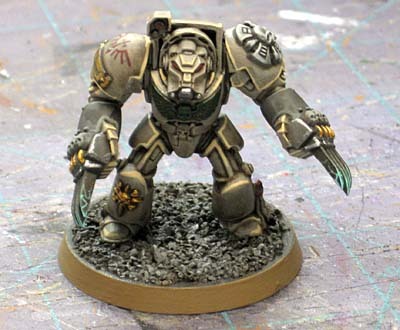 Grey armour with some variation of red, yellow and black markings that resemble what we all think we know about Space Wolves? Do that and all of a sudden, you'll find people recognise your force and bring all their Space Wolf fears to the table when playing you. Do you need 40 shades of grey and blue and black all blended together with intricate detailed symbols painted on each shoulder? Blood Angels will be another example... paint them blue and they won't have the same effect. But paint them red, add "blood drop" type imagery and all of a sudden, you've got Blood Angels and all the close combat ferocity associated with them. Do you need to have a base color of XYZ, highlighted up through 80 shades of red and then blended together to get some complex Blood Angels red formula? No. Find the essential characteristics, include those and you'll hit the mark every time. Ultimately, my Librarian failed (at being recognised as a Deathwing Librarian to your average player) because while I had the shape, my color was off and I had no icons to help the viewer figure out where the model belonged once they couldn't figure out the color and their brain couldn't match it with anything they already knew to jump to. But the idea works for any army. Unless you're doing some strange "counts-as" force, have obscure conversions, or have picked a completely unknown paint scheme, you'll already have the shape associated with your army. If you can figure out what it takes (as it relates to painting)for the viewer to look at your army and jump to the conclusion you want, you'll get all the added benefits of the model's rich background when people face off against you. Regardless of how accurate it may or may not be. Very true Ron... getting schooled in psych theory was not something I was expecting. 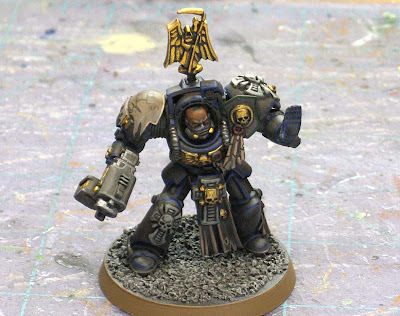 Even with things like Librarians in Space Marine forces, you can get away with an arm being blue while the rest of the model is the standard chapter colors. 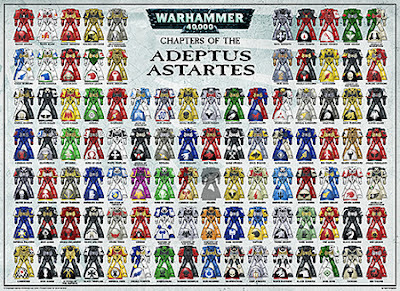 There was page in an older SM 'Dex that showed Libbys from the Blood Angels, Dark, Angels, etc, they almost all seemed to be alternate color schemes. With that particular model, your Libby, I love the fact you went back to the Death Wing's tribal markings. Seeing that drawing again was stepping in the way back machine for me. For myself, it doesn't matter that I can see exactly what it is across the table. Real military forces change and evolve their tactics and markings to keep the enemy guessing and keep them confused. If I was playing you I would ask you what that model was, not something a real enemy commander can do. Following these articles has been very fun, it wasn't a standard gaming article and I really dug that. Kind of reminds me of the thing that folks were e-mailing around several years ago that was full of deliberate typos and mis-spellings that talked about how the mind could still correctly interpret the meaning of text even with an absurdly high error rate in the text. you must get an award for that 3 part post mate... love the construction and the final argument was solid and well delivered. although i for one still like the look of the librarian, i do understand why he might not be recognised, but if he had been painted a nice blue with all the usual librarian bells and whistles he would have looked detached from the rest of your deathwing army. nice change from the norm. Ron does his best writing when he is presented with a challenge from the community. I loved your post on profanity in blogs, and this series kinda follows in that vein. Awesome work Ron! 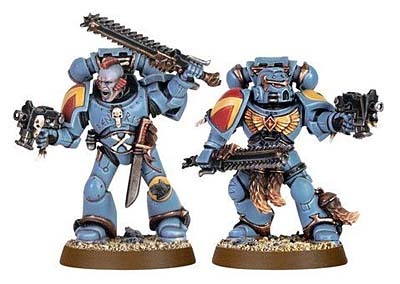 When I first read your posts on "recognise these", I started to think about iconic models in a space marine army, say Chaplains and Librarians. Yes, it is the colours and maybe some iconography and detail on them that makes them distinct from other models. But should we stick religiously to it? I remember that in a WD article regarding chaplains, it was mentioned that due to the fact that these individuals were for centuries in service of their chapter, and there is no easy way to repair or replace armour, as time passed their armour changed so that in the end there might be incorporating markings from their chapter, paints etc. Should this hold true for our models on the table? Wouldn't a chaplain bearing the colours of his chapter still count as a chaplain? If he is adorned with the usual regalia of his status then he could be made to our liking (still adhering to some generally accepted look)e.g., a librarian should have a psychic hood, in the end this is something he really needs in order to protect himself and function properly. Other than that, if his armour is bone white, or blue should make a small difference. This applies to modeling too but I tried to keep this to just painting. I've got lots of these littel things floating around in my heas and I'm trying to get them posted here slowly. Ulitimately it comes down to what you as the owner want your army to look like. Thinking about things like this might save you from having to explain yourself for the next 5 years each time you put your army down on the table and someone asks, "What's that?" Wow i never thought about the application of Sassure (or more recently Derrida) to the ideas of mintature gaming. The idea that the red and blood drop on minis in big suits of armor are signs of blood angels is fantastic. Fantastic arguement that the specific coloring and Iconography associated with each chapter works the same way as a drawing of a horse. And further that intrinsically we have traits that we automatically associate with each chapter is a further associative battle that we rage with eachother. I don't know if you are arguing in favor of having play style determining paint scheme though. For instance if you run fearsome CC, should you only run SW or BA? and if you like running termies and bikes maybe just DA? or just bikes is WS? Just something to think about. Luke: With this article I tried as best I could to stick to painting only. This applies to modeling as well. I never really thought about picking an army color scheme/chapter based on your play style and using one that is "historically" known for that style of fighting. That's another whole post or two. One of the most thought-provoking painting articles I've ever read. Very inspirational, I relate strongly to the discussion on colors as I design signs for restaurants/businesses and feel that the impact of color and shape is almost always underestimated by clients. wonderfully articulated and very well taught concept! Anon: Thanks! Glad you like it. There's so much to the hobby that you could easily get lost in any aspect.